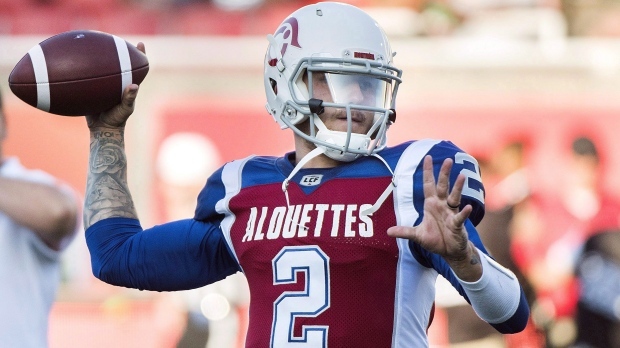 Johnny Manziel is back on the field with the Montreal Alouettes. After missing the past three practices with what the team described as a stomach flu, the former Heisman Trophy-winning quarterback was in uniform for the team's walk-through on Thursday. Antonio Pipkin is expected be the starting quarterback on Friday night when the Alouettes play host to the B.C. Lions. Youngster Matthew Shiltz is the other quarterback on the Als' roster. Veterans Drew Willy, Jeff Mathews and Vernon Adams are all on the club's six-game injured list. Pipkin has led Montreal to consecutive victories and is 2-1 as the club's starter. He has 762 yards passing with a TD and four interceptions while having rushed for 127 rushing yards and four touchdowns on 17 carries. Manziel has started two games for Montreal, both being losses. He has completed 27 of 46 passes for 272 yards and four interceptions.